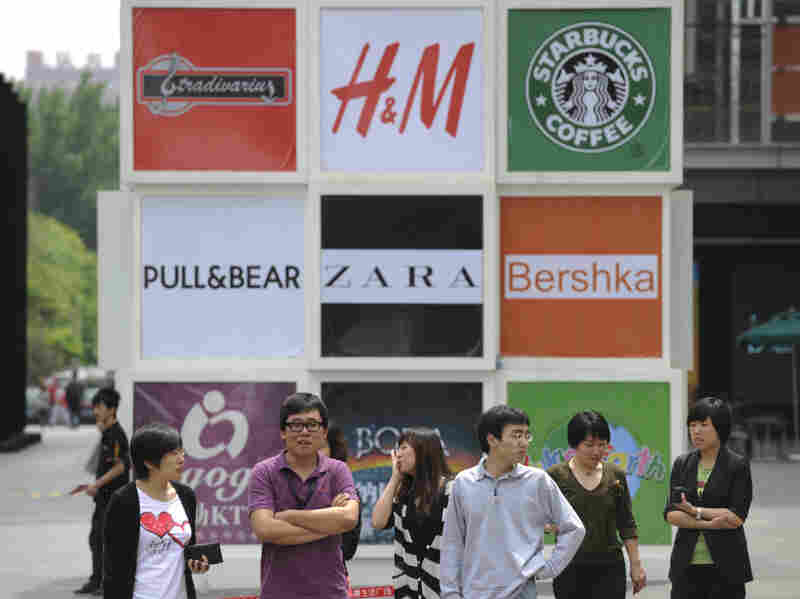 China's Businesses Boom, But Its Brands Don't After 30 years of mind-bending economic growth, everyone knows about brand China — but very few people can name a Chinese brand. And the reasons for that are not just economic. To move to the next level, the country needs to adopt social and legal reforms, observers say. This month, NPR is examining the many ways China is expanding its reach in the world — through investment, infrastructure, military power and more. After 30 years of mind-bending economic growth, everyone knows about brand China — but very few people can name a Chinese brand. And the reasons for that are not just economic. In a bustling market near the center of the Cambodian capital, Phnom Penh, Soray Peah, 24, is testing the ringtones on a cellphone she wants to buy. "I'll definitely buy a Chinese-made phone," she says, "because they're cheap, even though the quality is not great." But she doesn't know any Chinese brands, and in fact the brand she is going to buy is a fake Nokia, copied in China and sold throughout Southeast Asia. This reputation for Chinese-made goods holds inside more upscale stores in Phnom Penh, as well. Manager Tha Vy runs a smart store in a mall that sells electronics. "No, we don't have Chinese brands," he says. "We've got only Korean brands, and Japanese brands. Because [when] Chinese products came to Cambodia for the first time, the products were very poor quality." With that, a store manager in Cambodia puts his finger on a key point of China's rise. The country's cheap T-shirts and fake mobile phones: fine. IPads and laptops assembled for foreign companies: fine, too. But Chinese brands? It's not really happening yet. Half a world away, in Camden, S.C., American workers are attaching the seal on a refrigerator door. They're working at the American factory of Haier, a Chinese company that's probably the closest China gets to a known international brand. "I think we got good people, we got good management, we got good products," says manager Gerald Reeves. He says Haier is making quality goods, so it hasn't suffered from the image of low-end "made in China" products. "I don't know that it's really been a challenge, because it says 'Made in the USA' on our boxes," Reeves says. "And a lot of people don't even realize this is a Chinese company, truth be known." Reeves says that Haier is investing in research and development, to keep the quality of its products high. "We've got some R and D upstairs," he says. "If you're going to build products for an American market, you need to have Americans, for the most part, designing those products." 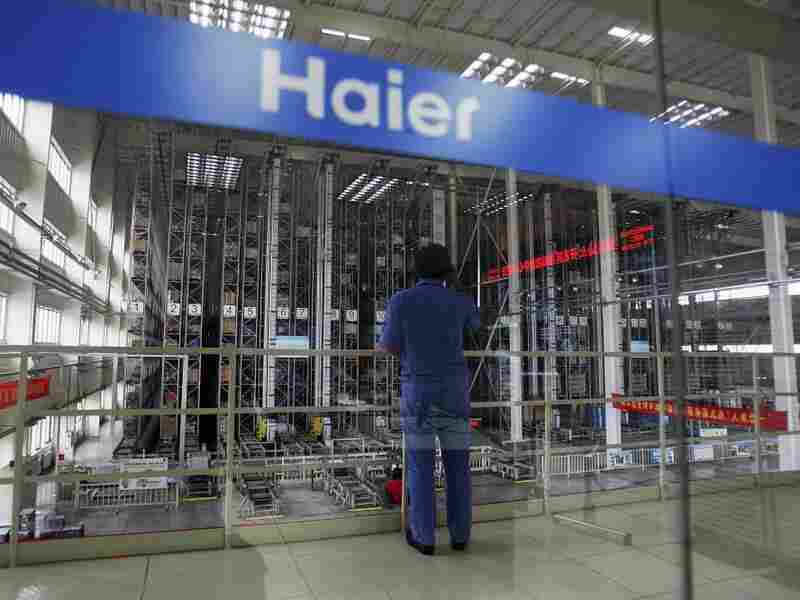 But many analysts say that Haier's limited success may in some ways be the exception that proves the rule. They attribute China's inability to develop and innovate to problems within China that go deeper than just the development of brands. A key problem for Chinese businesses is a comparative lack of legal protection. "If you're going to innovate, if you're going to be entrepreneurial, if you're going to create and invent things, you need a legal system that can protect your invention," says Paul French, who works for the Shanghai consulting firm Access Asia and has lived in China for nearly 20 years. "The government should take the lead on that, and an independent legal system needs to be able to do that, and to respect the rights of entrepreneurs and innovators," he says. "And at the moment, that is simply not the case here." French says that intellectual property rights is one of many issues that need to be dealt with if China is going to move up to the next level. "The big picture would be the environment; the big picture would be social welfare — health care and pensions," he says. "Then it would be education, and the ability for students and academics to challenge the consensus, to challenge the official version of things." Continuing down his list of reforms needed in China, French says, "We need to have freedom of the press, so that confidence in the stock market can be maintained. We're going to need better ethical and corporate governance, and that's going to mean a lot more transparency, both from government and from corporations." Any one of those issues on its own would be hard enough to reform; the fact that China needs to address all of them is a monumental and risky task. Modern Chinese society is simply becoming too complex to be contained within the old political and social framework. It's not just Westerners who say some of the entrenched cultural and political issues have to change. Take education, for instance. Chinese-born scientist Shi Yigong went to the United States in the 1990s, to study for his doctorate at Princeton University. He rose rapidly to become a full professor of molecular biology. Then, in 2008, to his colleagues' amazement, he decided to give up his tenure, return to China and become dean of life sciences at Tsinghua University in Beijing. Shi says he owes something to his homeland. And like seemingly everyone in China, he knows there is one word that sums up the challenges there. "Of course, it is the system," he says. "China [does] have a lot of talented scientists and engineers. People are very smart in China. But the mechanisms for people to apply their talents, for people to innovate, are not there yet. That needs to be resolved." But the system, and indeed the culture, is very difficult to change. And Shi admits that he sees the problems even in himself. He encourages his graduate students to innovate, and to challenge their teachers in a way the Chinese education system does not. But Shi realized recently that when his own children get home from school, the only question he asks them is if they listened to their teacher. "For someone who stayed in the United States for 18-19 years, who's been really influenced by Western culture, still the question was, 'Did you listen to your teachers?'" he says. "We are told to listen, we are told to accept. We are told not to doubt authority. So I think that element is very hard to do away with, because that's part of our culture." Observers point out that discouraging students from questioning teachers can also be a political issue: If you start to let kids question authority, who knows where that's going to end up? Faced with a need for so many reforms, a natural question arises: Can China continue to be a one-party state? French, the consultant, thinks so. "People said you can't have private property ownership in a one-party state," he says. "People said you can't have a banking system that gives out loans and mortgages in a one-party state. People even used to say you can't have a one-party state where people are just given passports and allowed to fly off to other countries, because none of them will ever come back. "Well, it turns out you actually can have a one-party state and those things. You know, we're off the map here. I think we're going to find that there's a lot of things that you can have, and still have a one-party state." We are indeed off the map here. The extraordinary experiment that is modern China — staggeringly impressive, though brutally flawed — is utterly off any map that has ever gone before. And there's possibly just one thing that could be more difficult to implement than the transformation the Communist Party has made in China over the last 30 years. And that's the transformation it needs to make over the next 30.